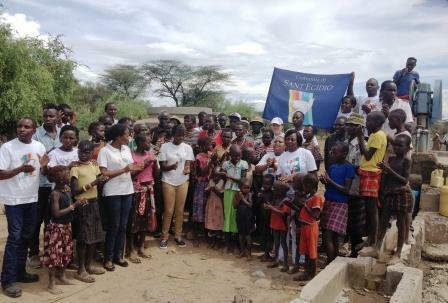 The communities of Sant’Egidio in Kenya and in the world continue to be faithful to their commitment of solidarity with the Kenyan North East regions affected by drought. Two boreholes were recently open in East Pokot, in Ndonyosaz, a semi-desertic region inhabited by a semi-nomadic population, a gift that responds to a serious need of the area. As we read on Sant’Egidio website, www.santegidio.org, “this water supply is part of a larger program of the Community to fight against famine, struggle which was brought on since almost three years here and in different areas of the country. The boreholes are complete with purification implants to remove the noxious fluorides, characteristic of the local terrains”.